​If there is one thing all college football fans can unite behind, it's an enduring dislike or even hatred for ​Alabama. And for those who ride or die with Auburn, the contempt burns with an explosive passion. The Tiger faithful had a heck of a bowl season thanks to their team's 63-14 rout of Purdue in the Music City Bowl. And after the Tide fell to Clemson in the national title game, perhaps nobody was happier than their Iron Bowl rivals. Clemson blowout in the natty over Bama felt so good, in fact, that a couple of Auburn fans decided to relish their championship celebration themselves. 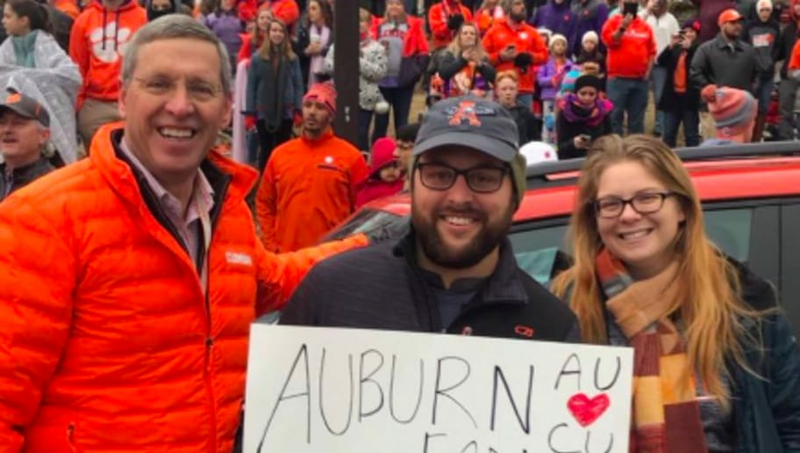 Yeah, these Auburn fans actually took the time to make the trip ​​to South Carolina to celebrate the Tide's defeat. That's a three-and-a-half hour car ride, if you were wondering. Gotta respect this level of fandom. When your arch-rivals ​​lose in the biggest game of the season, you have to celebrate any way you can. Does it mean too much? Of course it doesn't. We're talking Roll Tide-War Eagle here.